DISCLAIMER: The records are unplayed, but being released in 1993 and stored ever since, the sleeves are not in mint condition. If that makes you feel bad, don't buy it. Every copy is sold as is with no returns accepted. 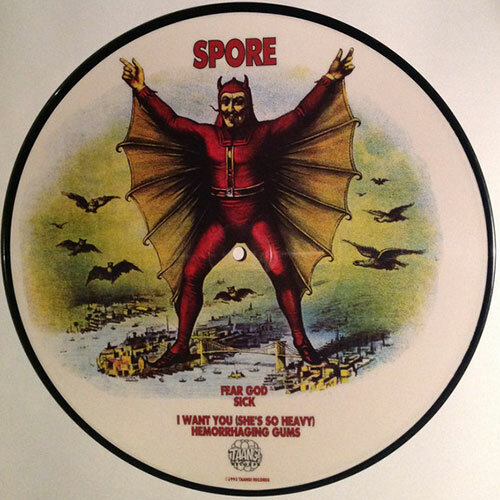 Spore was a noise rock band from Boston, Massachusetts formed in the wake of the early 1990s grunge movement. Spore were signed in 1993 on the Taang! Records label, the same label which initially signed The Lemonheads, The Mighty Mighty Bosstones and Mission of Burma, with whom the band released a 7" split EP. Lead singer Mona Elliot's voice has been described as channelling "anger and determination with a style heavily influenced by early Throwing Muses-era Kristin Hersh." The Spore song "Fun", from the group's third album was included in the Natural Born Killers film, though it was not released on the official film soundtrack CD. The band was also known for sporting an image of André the Giant on their disc covers, with the image being similar to Shepard Fairey's well known pop art interpretation, Andre the Giant Has a Posse. Elliot went on to form another well-regarded Boston-based band, Victory at Sea, in 1996. Ayal Naor started up the avant-garde band 27 with members of the Boston band Dirt Merchants, while also contributing on fellow Boston band Isis' critically acclaimed album "Oceanic" as well as touring with the band. The picture 10" edition includes two more tracks than the 7" by the same title.